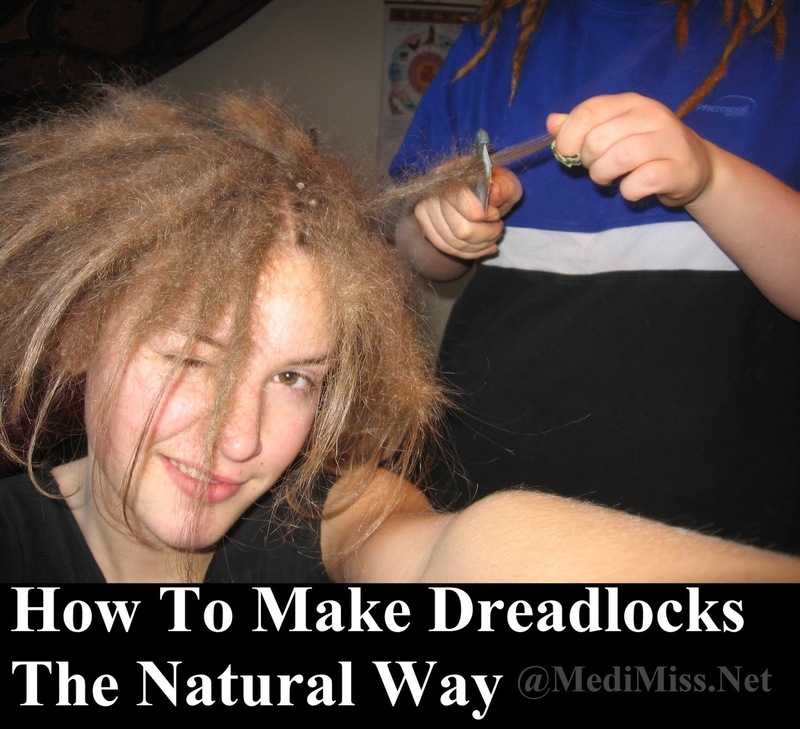 This is an article explaining how to make dreadlocks the natural way, i.e. without recourse to hair extensions or special dreadlock products of any kind. Using these methods you will be able to grow a full set of dreadlocks in a few days, weeks or months, depending on your hair type. The natural method of making dreadlocks giving them more of an organic look, and they appear less synthetic or contrived. Dreadlocks worn by hippies, travellers, ravers and surfers tend to be of the natural variety, and artificial locks tend to be rare on these scenes. First off I'd like to dispel a common myth: dreadlocks are not a Rastafarian-only hairstyle. Rastafarians have certainly popularised dreads (and given them their name), but they have been worn for thousands of years on people from many cultures (Ancient Egyptians, Hindu ascetics, Celts and Vikings were all known to have worn their hair in locks). In fact, dreadlocks have been around since before combs, so to assign them as a symbol of any particular ethnic group would be to deny a huge swathe of anthropological history. Just a minor point I wanted to make (having been called "Rasta Man" for a number of years by people I don't even know). Pure natural method for making dreads. Easy, right? As long as your hair has even the slightest wave to it your hair will eventually dread up. Takes a while to go in if your hair is reasonably straight, like mine, but it will do it. You do need to rip your hair into dreadlock-sized sections once it has matted, or you will be left with just one huge, fat dread stuck to a random part of your head like an amorous, hairy whelk. An interesting look if that's what you're after, but it does make you look a bit lopsided, and drunk. Sometimes parts of your hair will refuse to separate properly and will keep settling back into a mat (particularly around the back of your head). If this happens a rubber band or two near the base will keep them apart for long enough that they develop into distinct individual dreads. The elastic band will eventually fall out of its own accord. Mostly natural method for making dreads. It's easier to get someone else to do this for you, but it takes time so you'll do just as well doing it yourself while watching TeeVee or listening to some tunes. First of all, find yourself a nice clump of hair. Decide how thick you want the dreadlock to be and try to section off that thickness; if you find that some strands don't seem to belong to that section then pull them away or they'll just divide off later when the dread starts to form. You'll soon see what I mean - the hair on your head falls into natural sections and it's easy to tell which bits belong where. Now that you've got a section, knot it. Pass random pieces of the hair over each other, as though you were doing a very bad plait, and then pull the hair tight. You should soon feel a clump forming at the bottom, which is your dread. Keep going for as long as you can be bothered (you can always cut off the un-dreaded, wispy parts later if you like), making sure not to be too regular in the pieces you select to pass over each other. I like to use all of my fingers in this process, each holding a random chunk of hair from the section, and I try to pass them all through each other at once. If it feels like you're making a mess of it, you're winning. Once you've finished that section, move onto the next, and keep going until they're all done. This can make your hands ache, so don't worry about trying to do the lot all in one go unless you have an important business meeting to get to or some such. Two or three dreads a session is plenty. Some of the thinner, shorter hairs around the back and sides might not want to dread properly - if that is the case then my advice is to ignore them, because even if you do get them into a dread then they'll soon just fall out again. After following the above method you will have a head of irregular, partial dreadlocks. Over the next few days, weeks or month they will become fuzzier and develop harder cores. At this point they will start to look like proper dreads and you can finally leave your house truck, tipi, tree-house or skip and meet people again. Hooray! To wash or not to wash, that is the question. It's a matter of personal taste, really. Eventually your natural oils will take over and your hair will clean itself, but it takes about three (itchy) weeks for this to happen, and your hair will still smell a bit to others (but not to you, strangely). Shampoo can stick in your dreads and even untangle them a bit, but it does stop your head from itching. A good middle ground is to wash your hair with water but not shampoo, and while your dreads are still settling in to avoid being too rough while washing them. If it smells and itches and you don't like it, clean it. If not, don't bother. It's the crusty way. There are a variety of products available nowadays to help with cleaning and maintenance of dreadlocks. Spurn them, I say, and spurn them good. Dreadlocks are the laziest hairstyle in the world once you've got them in, so why make them any harder or more expensive than they need to be? Wear them with pride, and big clumpy boots. Your hats might not fit anymore, but your lifestyle will. Yay!